The Canadian Council for Refugees published today its recommendations for next steps to protect the rights of migrant workers in Canada, in the wake of the parliamentary committee report on the Temporary Foreign Worker Program. The Standing Committee on Human Resources, Skills and Social Development and the Status of Persons with Disabilities (HUMA) recently concluded a review of the program and released its report on 19 September 2016. “Now that the committee has tabled its recommendations, the government needs to act quickly to address the abuse of migrant workers in Canada by making fundamental changes, guided by the principle of protection of migrant workers’ rights,” said CCR president Loly Rico. For more information, please read their full news release here, or the CCR response to the HUMA report here. The Campaign starts in January of the 50th year of the Seasonal Agricultural Workers program and will include a Pilgrimage from Leamington to Ottawa in time for Thanksgiving season on October 2nd and 3rd, 2016. The Pilgrimage will highlight the reliance on farm workers across its route as it crosses Southern Ontario and will culminate with a clear message to the Federal Government of Prime Minister Justin Trudeau: Justice is 50 years overdue. They are calling for support via a petition and donations; we encourage you to check out their website and support this important campaign. You can read their entire statement here. The Migrant Worker Solidarity Network and the Canadian Centre for Policy Alternatives, Manitoba are proud to release Migrant Voices: Stories of Seasonal Agricultural Workers in Manitoba. The report was released today, May 15th, at an event at the Manitoba Legislative building. 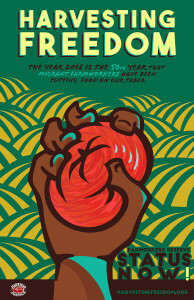 Migrant Voices is based on interviews conducted with migrant farm workers in Manitoba during the summer of 2011. About 400 workers come to Manitoba every year, mostly from Mexico, to plant and harvest much of the produce grown in Manitoba. Welcome to the website of the Migrant Worker Solidarity Network! We’ve spruced up the website- you can now find above more information about the MWSN, see what we’ve published on the issue of migrant workers in the province, and see how you can get involved to support migrant workers in the province. We would also love to hear from you: you can contact us at info@mwsn.ca. Send a letter to Minister Jason Kenney and oppose the changes to the TFW program! As you may have heard, on November 9 the Federal Government will be making major changes in the regulations covering migrant workers in Canada through the Temporary Foreign Worker program. Under the guise of better protecting these vulnerable men and women, the proposed regulations will actually negatively impact them in a very serious way. 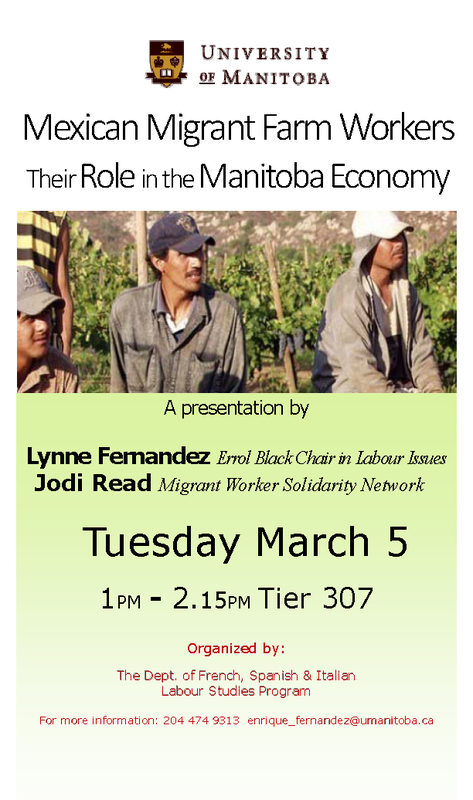 The Migrant Worker Solidarity Network of Manitoba will have a table and some informational material available at the Global Justice Film Festival, including a petition letter on gaining provincial health coverage for migrant workers in Manitoba through the Seasonal Agricultural Worker Program.